As well as individuals I’ve carried out work for private members clubs, embassies, and for corporate clients. I pride myself on leaving my customers happy and have many repeat customers with whom I can put you in touch for further references. I have a chest of drawers and matching wardrobe which are quite old and very precious to me. Two tenants had decided that a drawer that stuck was no use and threw it out (yes, really). Katie managed to make a copy from nothing which is indistinguishable from the ohers. She is brilliant at her work, enthusiastic and a joy to work with. Cannot recommend highly enough. Katie restored our beloved antique table which had been battered and worn over 15 years of hard use, and now looks as good as new, with a beautiful rich colour and patina. She was absolutely brilliant and a pleasure to work with. 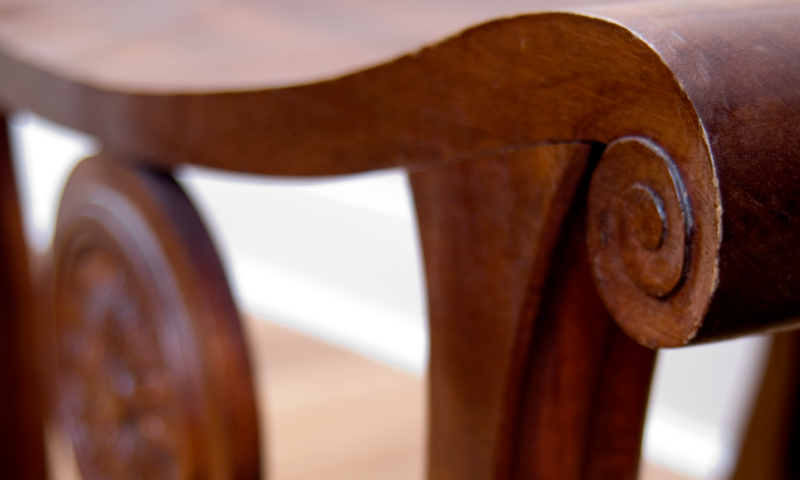 Did the most brilliant job on an old French country chair that was almost beyond hope. It was past the rickety stage and was falling apart with some bits missing. After a skilled and sensitive repair the chair is very stable and looks absolutely great . Highly recommend on both professional and personal level. Having been left a set of dinning chairs, that had not received any TLC for many years; they began to quite literally fall apart. We contacted Katie who talked us through the options available and made the whole experience very personal. The work she has carried out is great, attention was paid to small decorative details that make the chairs so unique and they are now used daily in a busy household. I wouldn’t hesitate to recommend her services again. We manage beautiful high spec investment properties for our clients and only use the experts when it comes to repairing luxury furnishings and interior woodwork etc. Katie was friendly, professional, flexible and ultimately provided a great service with excellent results. We will definitely use Roseberry House in the future should the need arise. I would like to thank you very much for the work that you have done – both davenports look great and it is wonderful to see them back to how they should look – I know my parents would also be delighted. Thank you so much for the quick turnaround with it all and for everything you have done – first class and greatly appreciated. I am delighted to have found Katie Keat and cannot recommend her highly enough. Her passion for what she does, coupled with her expertise ensures that each piece of furniture is lovingly restored and repaired, irrespective of its value. A beautiful mahogany grandfather clock case, a 19th century French bureau, a delicate display cabinet and a rather battered campaign table – all came back looking proud and happy to be alive and glowing. They have taken on a new lease of life and we are delighted with them. I can recommend Katie Keat of Roseberry House Restoration wholeheartedly. She restored some furniture which I had inherited very professionally. In particular, she turned a weather-beaten desk into a thing of beauty, making it look like it had never been neglected or damaged. As well as being highly skilled, she is very easy to work with, and is flexible and inventive. Her charges are reasonable, and she has always delivered more than I expected, on time. Katie has been restoring antique furniture for me much of which had lain in storage or suffered damage through transport for the past five years. My collection of English and French 18th and early 19th century furniture has been significantly enhanced by the quality of her work. She avoids the over-restored look that one so often sees. She has also advised me on new acquisitions and reported on condition of items of interest to me appearing in the main London sale rooms.